There are an unusually large number of spectacular waterfalls close to our holiday cottages. In ‘Waterfall Country’ one can experience the exhiliration of walking directly behind a thunderous waterfall to peer at the surrounding countryside through the cascading water. The nearest waterfall to our holiday cottages is only fifty yards from the doorstep– the magnificent ruins of an historic weir. The highest waterfall in the Brecon Beacons National Park, Henrhyd Falls, is only 12 miles from our cottages – over 90ft and you can walk behind it! Many of our guests visit The Waterfalls Centre in the village of Pontneddfechan – many great circular waterfall walks start here. Over 15 waterfalls make up this stunning natural attraction. By choosing a cottage near waterfalls, caves and museums you will be sure to have a great holiday – whatever the weather! Waterfall walks are a great holiday activity whatever the season. There are few things better than a winter walk in waterfall country followed by a pint and a hearty pub meal by an open fire in one of the many charachterful pubs dotted around the Brecon Beacons National Park. To visit Waterfall Country, our holiday cottage guests head for Pontneddfechan, just 16 miles up the A465 where there is an excellent tourist information centre “ The Waterfalls Centre. 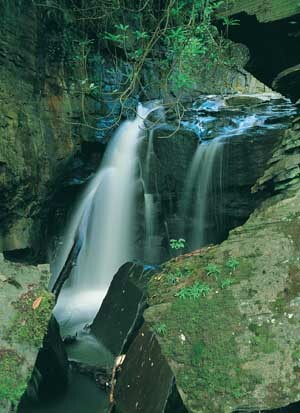 Youll be able to find the booklet Waterfall Walks (or purchase one at Plas Farm farmhouse before you set off). Also at the centre is a new interactive exhibition, so that you and your family can learn about how these amazing falls were formed before going to see the real thing for yourself. They even hire out activity rucksacks for the kids, which prove very popular.There are many walks to be done around here, of varying distances and taking in as many as four spectacular waterfalls, including the not to be missed Sgwd yr Eira “ another one you can walk behind in most conditions. The more adventurous can even get into the water and take a gorge walking trip with a local adventure school. Around the same distance away from our self catering accommodation you will find Henrhyd Falls, near the village of Coelbren. You can approach the falls from a distance and walk through the beautiful Nant Llech valley if you want. Otherwise, there is a parking spot above the falls, and then a path down to the waterfall (can be muddy). A little further to the north is Ystradfellte, one of the most impressive limestone landscapes in the British Isles. Lush deep ravines carve their way through the limestone ridge to the south of the village, with great pavements of bone-white rock littering fields next to potholes, disappearing rivers and crashing waterfalls. Seeing the River Mellte tumbling into the dark and icy mouth of the Porth-yr-ogof (White Horse Cave) is a sight not to be missed.